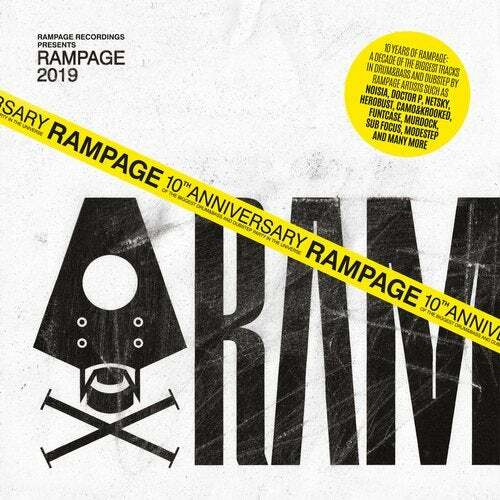 To celebrate 10 Years of Rampage, a decade in which the brand managed to build itself up to the biggest event of its kind worldwide, 2018-founded Rampage Recordings pulled out the big guns. On the one hand there's a selection of the biggest tracks in the history of drum&bass and dubstep, recorded by artists that have previously graced one of Rampage's line-ups, and on the other hand a collection of exclusive tracks made by this year's artists, showcasing where the genres are heading in the future. Classics are delivered by Netsky, Sub Focus, Wilkinson, Doctor P, Roni Size, Herobust and?Noisia, while the next generation is repped by Distress Signal, Cyantific, Infekt & MVRDA, Macky Gee, Dirtyphonics?and Murdock.